Comments: Slow growing would be an understatement!! At perhaps 1/2 to 3/4 inch a year this IS the slowest of the dwarf boxwoods. Extremely dense foliage growing into a tight bun. It might reach 6-8 inches in 10 years, but don't count on it. 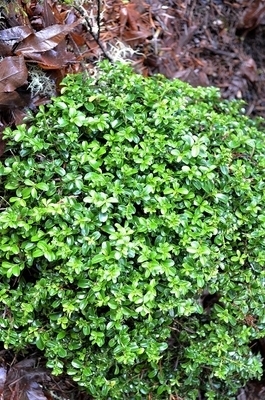 Sadly, it is often mistaken for Buxus m. 'Compacta' and several websites sell 'Compacta' as 'Kingsville'. Two very different plants.